Have you ever noticed that it takes about as much time and trouble to cook a nutritious meal for one or two people as it does for four or five?Maybe that’s why so many of our residents say one of the things they enjoy most about Daystar Retirement Village is our restaurant-style dining. No more worrying about what to cookor looking at a sink full of dirty dishes when dinner is over. The convenience of restaurant-style dining is obviously an advantage, but there are health benefits as well. Seniors living at home, especially seniors living alone, often fall into a routine of eating the same meals night after night or sometimes skipping meals altogether. When seniors limit their food choices, they put themselves at risk for malnutrition because it’s harder to consume the variety of nutrients needed for optimal health.Another problem for some seniors is that eating the same foods day after day can make those foods less appealing, so they eat less. According to the National Resource Center on Nutrition, Physical Activity and Aging at Florida International University, malnutrition can lead to lost weight and strength, lessened immunity to disease, confusion and disorientation. Malnutrition exacerbates frailty and debilitation, which leads to a host of problems, including causing more stress and concern among family members. At Daystar we take pride in the food we serve every day because we know it makes a difference in the health and well-being of our residents. A typical breakfast menu might include eggs to order, a two-egg omelet, buttermilk pancakes, hot cereal, bacon, fruit and toast. Researchers say breakfast is the most important meal of the day, and we want to make sure residents get off to a good start. Choices for lunch and dinner are even more varied, with a sample lunch menu offering diners a choice between spaghetti with meat sauce, grilled cheese sandwiches or Chinese chicken salad. The dinner menu might include prime rib, roast chicken and Cobb salad. 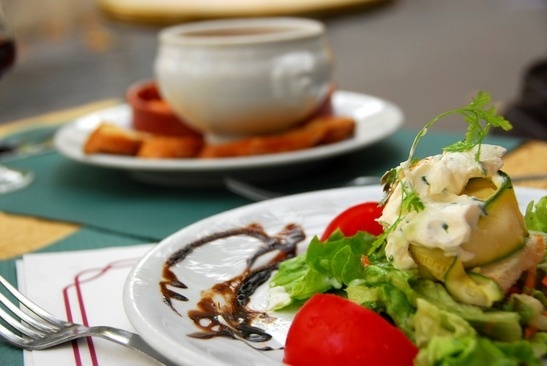 The menu always includes a variety of fresh vegetables and other side dishes and a full selection of desserts, including sugar free and low-calorie options. And here’s another reason why serving tasty, nutritious food is so important: meals at Daystar Retirement Village are an important time for socializing and building community. When the food on the table is tasty, the talk around the table just seems more lively. Visit us today and see how delicious dining at Daystar Retirement Village can be. Bring your appetite!